SQLyog is a fast, compact Win32 Front End for MySQL. Execute multiple queries, export data in CSV, HTML & XML. Import from textfile. Export data and schema itself. Flush hosts/logs, etc. Diagnose your databases and much more. Interface is kind of cluttered looking and not as intuitive as it could be. Took me a while to figure out how to run a query. If you terminate the query with a semicolon and try to to execute it, it won't work, either have to leave off the semicolon or place the cursor in the middle of the query. I think I'll just stick with the official tools for now. They are much cleaner looking and more intuitive, and also released under the GNU GPL. They can be located at http://dev.mysql.com/downloads. Just scroll down to where it says "MySQL Tools". 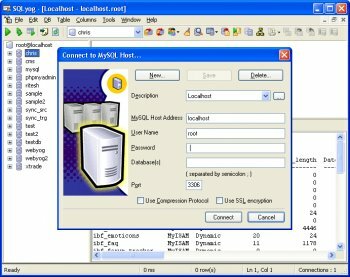 MySQL also develops Graphical User Interface applications for administering MySQL Server and working with data.